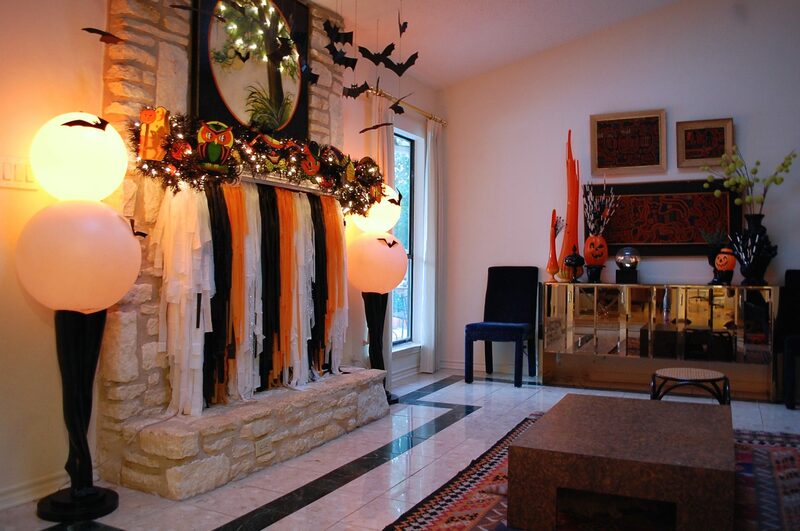 Where do you find your Halloween art? This is a question I get asked a lot and the answer is often that I made it. When I found these paintings, prints and photographs at the thrift store they didn’t scream Halloween. It’s the DIY treatment I gave to these pieces that made them fit the Halloween theme. 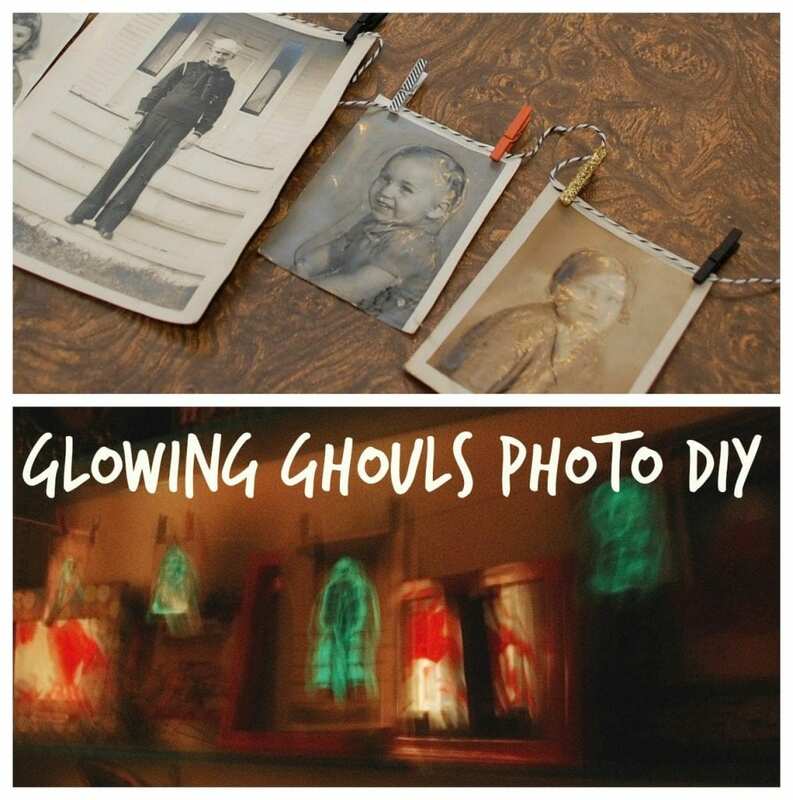 This is one of my favorite ideas for revamping thrift store art for Halloween and this project took all of about 1 hour to make and 40 of that was paint drying time. So out of these 3 larger pieces of art all were either found at a thrift store or garage sale. The photograph was given to me and I added the cape, hat and fangs. Sure, I wouldn’t do this to a family heirloom but I have no idea who these kids were so they are free game for a Halloween makeover. Same for the black silhouette profile. Someone had this portrait done and then dropped it off at the thrift store for me to add a skeleton. Today we are talking about the little boy and his dog. This is a mass produced print on paper so no true pieces of art were harmed in the making of this project. 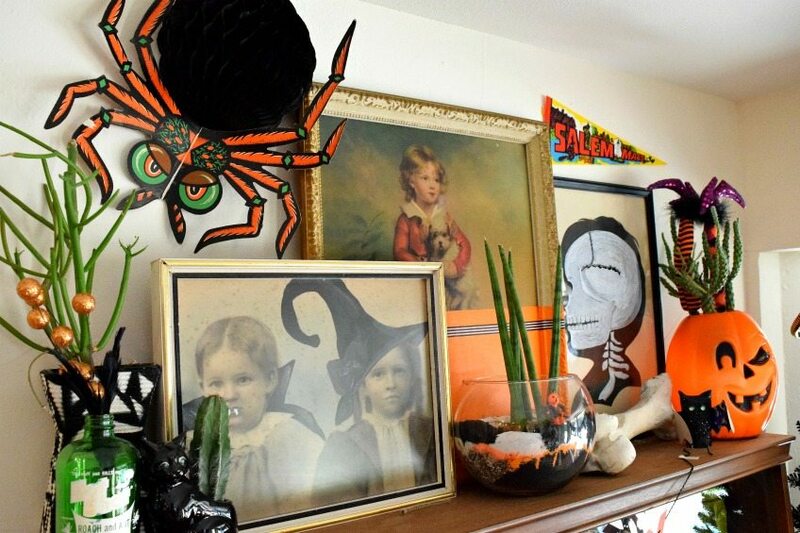 Here is a big pile of thrift store art I gathered for my Halloween Gallery Wall I created over on the DIY Network. The chalk woman was made into Medusa, the pencil sketch of the boy got a felt Halloween mask, the three children became witches and I just stole the frame from the photograph. Let’s talk about the little boy and his dog. Brace yourself for how easy this Halloween art is to make. Step 1 add washi tape or painters tape. Where you put the tape depends on what portion you want covered in paint. 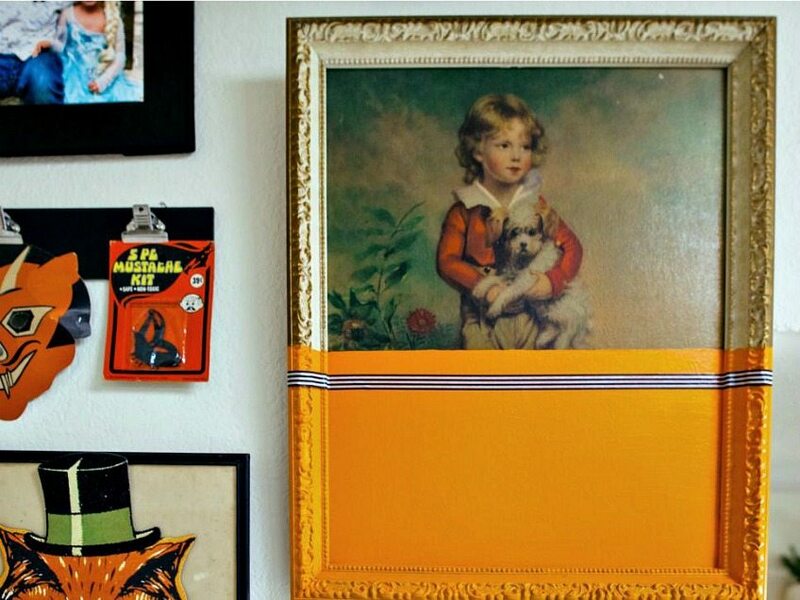 We want this painting to look like it was dipped into a vat of orange paint. 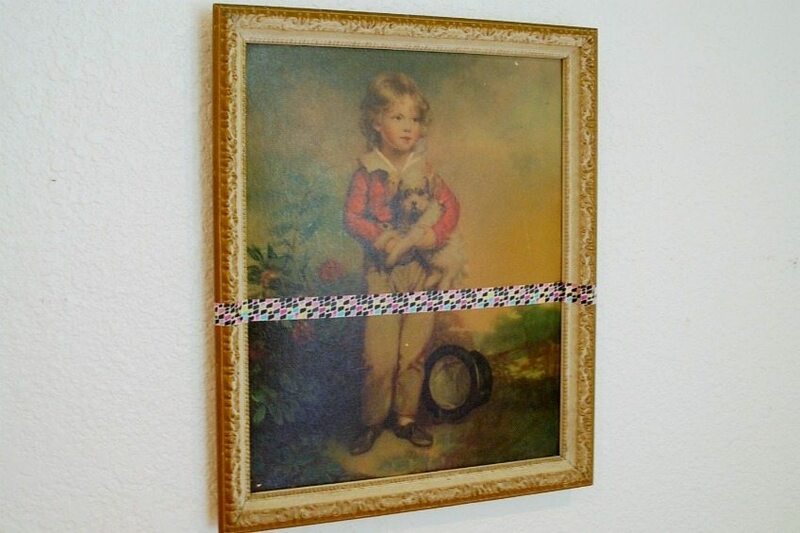 The tape is acting as a guide for your painting so there is a straight line. Use regular craft paint in orange. A couple of coats may be required to get the color opaque. 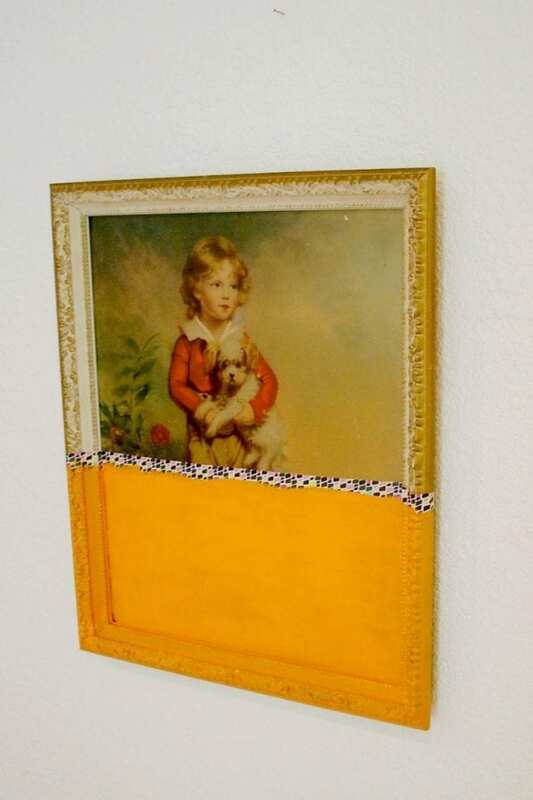 Be sure to also paint the frame – remember we want the painting to look dipped. Allow the paint to dry completely. Remove the original piece of tape that acted as your straight line. Take care not to rip the paper if you are working with a print like I did. Add a second piece of washi tape for a decorative spin if you want. I did! Add this piece to your Halloween gallery wall. 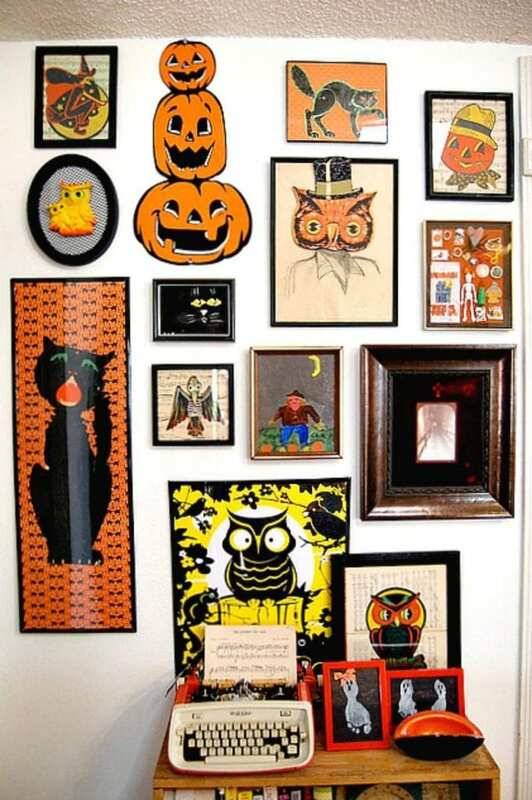 Other ideas for your gallery wall include Halloween Photo Posters, DIY Marquee Light Candy Corn and Halloween Scrapbook pages. Don’t have the will power for a full gallery wall? That’s ok, a small cluster with just a few items works great too. 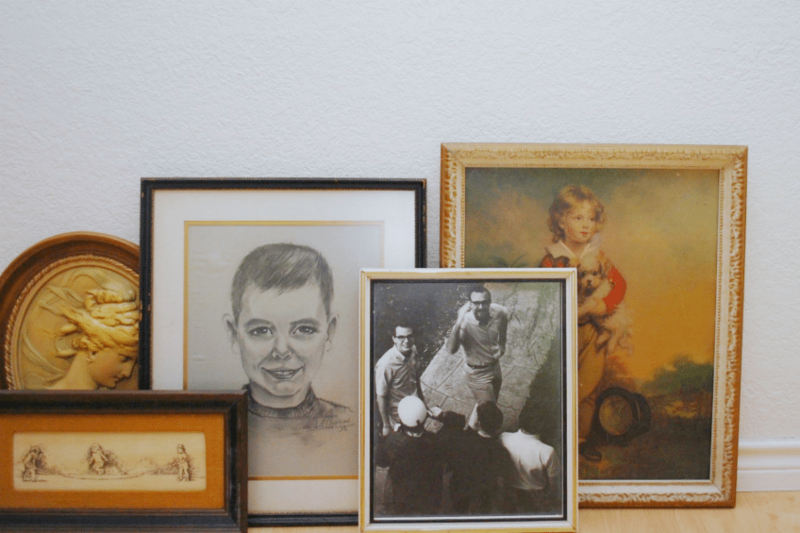 Seen any art at the thrift store, flea market or garage sale recently that have been begging for a makeover? 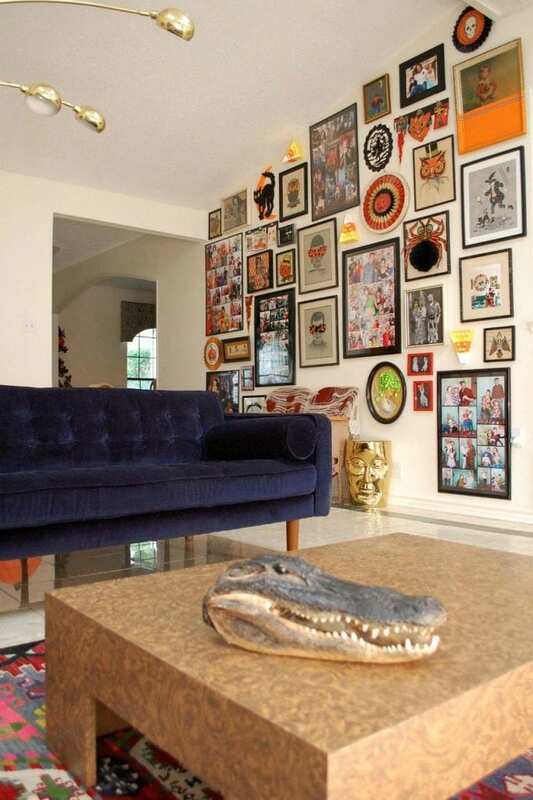 I always say art is not bolted to your wall and items are not super glued to your shelves. Have fun during the holidays and switch some of these items out with some festive DIY art of your own! Want more Halloween art inspiration? Let’s do this! Glowing Ghouls – This was originally a sponsored post using glow in the dark paint to accent old black and white photos. Super duper creepy! 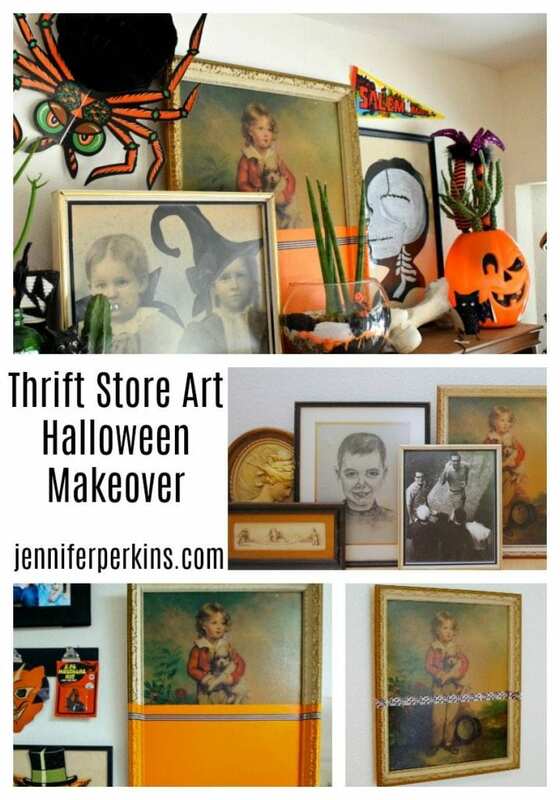 Light Up Halloween Art – More thrift store art makeovers. This time I touched up some paint and added lights to this giant painting. 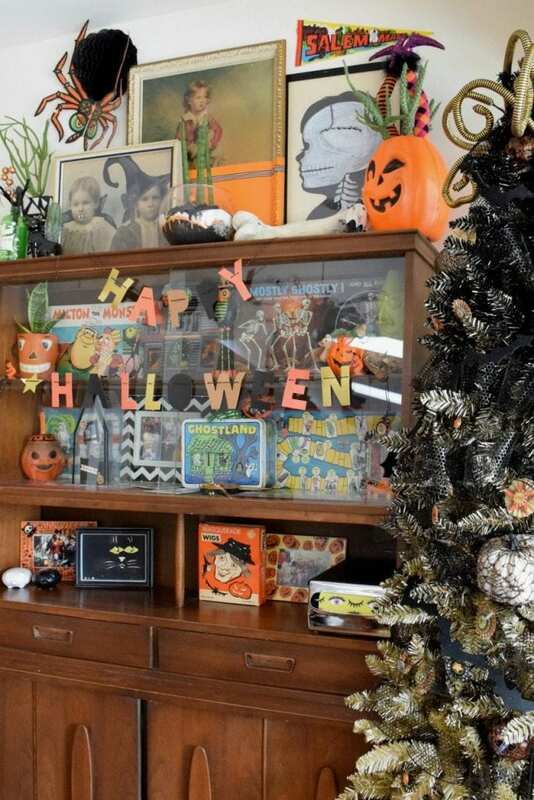 Halloween Toy Collection – Another option for a Halloween gallery wall is a shadow box full of vintage Halloween toys. Posted October 5, 2017 & filed under Crafts, Halloween, Holidays, Recycled Crafts.